IUCN started the idea that sustainable use of wild living resources can be a powerful tool for conserving nature. The United Nations Convention on Biological Diversity, agreed in 1992, defines sustainable use and mentions it more than five times as often as protection of species and habitats. It was implicit in CBD's Malawi Principles (the Ecosystem Approach, 1998), IUCN’s Amman Statement on sustainable use (2000), and CBD's Addis Ababa Principles and Guidelines (2004), that conservation through sustainable use needs devolution of adaptive management to people as close as possible to local level. These documents, initiated by IUCN’s Sustainable Use Initiative, reflected awakening in Africa of Community Based Natural Resource Management. In contrast, Europe focussed on top-down measures to constrain use of wild resources, with more and more land used intensively for plant and animal crops to meet consumer demand and EU-subsidy. There is a growing desire for state funds to encourage conservation by farmers and foresters, if only to maintain water, air and climate quality, but conserving nature while growing crops efficiently is complex. Although a cooperation of UK government and IUCN saw a way to meet this challenge 15 years ago, two EU-funded projects were needed to design a system that could combine science with local knowledge to support land-use decisions that would be good for nature as well as for livelihoods. Sadly, before satnavs put AI-based decision support everywhere, the system was deemed beyond requirements and too ambitious for EU funding. However, volunteers in IUCN Commissions are dedicated to nature conservation and were not deterred. We devised a way to speed uptake of an eventual environmental support system, by getting people across Europe thinking of the community-based mapping that it would require, and by surveying them about what it needed to do. The result, in 2011, was naturalliance.eu. Since then it has become ever more urgent for rural communities worldwide to learn fast how to benefit sustainably from nature, to help keep climate benign and to elect politicians so minded. However, it has also become clear that, given appropriate software, dedicated volunteers could run networks for global-with-local activity very cheaply. Thus, we will launch naturalliance.org, as a hub to network in 44 languages with local communities worldwide, in April 2019. 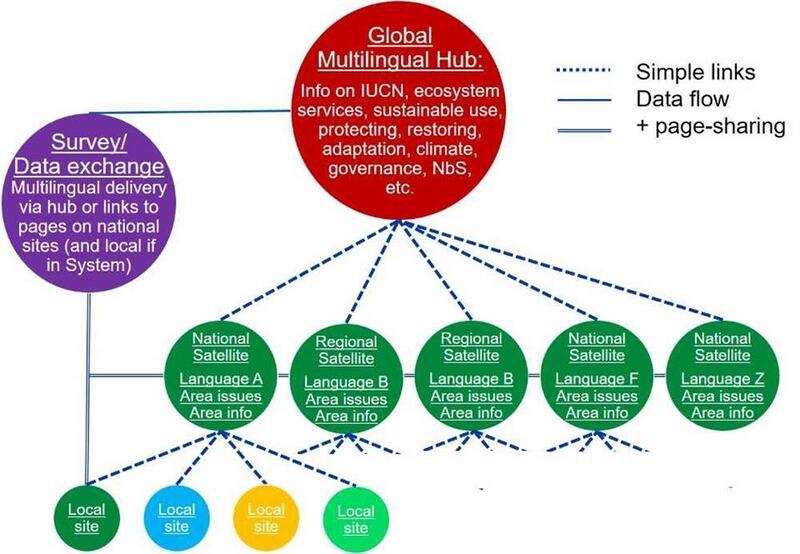 The principle of the system is a multilingual hub (red) which explains general principles for conserving the natural world (click the figure to expand, use ← to return to this page). 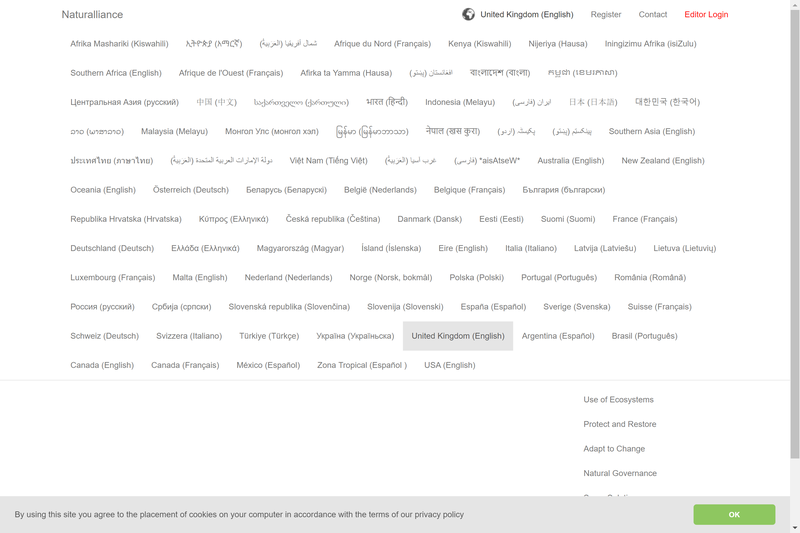 By selecting a language and area where they live, visitors can click through to a regional or national monolingual satellite (green) which is rich in knowledge for that area and links to local projects. All the satellites are part of a single network, so it is easy for them to channel information (purple), at first on surveys, but later potentially as environmental data for decision support to manage land and livelihoods. This new network would not have been possible without the support of the International Association for Falconry and Conservation of Birds of Prey for developing Sakernet and Perdixnet. It depends crucially on Patrons shown at bottom(right) here. Many thanks also to drafting by Adrian Lombard, Julie Ewald, Kartik Shanker, Madeleine Nyman, Marina Rosales Benites de Franco, Meera Anna Oomen and Scott Brainerd.